Ensure tickets are addressed in the appropriate order with Guided mode, a custom role option that requires agents to work through tickets using the Play button. In Guided mode, agents can access views using the Play button. When agents click the Play button, the system automatically opens the first ticket in the view. After addressing the ticket, the agent clicks Submit to update it and automatically move to the next ticket. The Submit button is not available until a change is made to the ticket. The next ticket is the next ticket in the view according to the view's sort order (see Using views to manage ticket workflow) that the agent hasn't already skipped and that no other agent is currently viewing. For more details, see Using the Play button. See and open all tickets assigned to them in the system Your assigned tickets view. Click on any other view to open its available ticket and start Play mode. They won't be able to see a list of the tickets in the view. Once they've started a view in Play mode they can click Skip to skip a ticket, but are prompted to enter a reason. Keep in mind that agents in Guided mode will still be able to view and open tickets they have access to from end-user or organization profiles and through search. You'll need to create or edit a custom role and assign it to the agents who should have Guided mode access. For details, see Custom agent roles (Enterprise). Next to the role you want to modify, click edit. In the Tools, section, click the drop-down menu next to What can this agent do with views, select Play views only. In Guided mode, agents can choose to skip a ticket. After they click Skip, a window appears prompting them to enter a reason. Note that Guided mode agents can still click Skip in the above window without entering a reason. If you're looking for specific information from agents when they skip tickets, you should communicate expectations on entering reasons and how you'll be using the responses. Review skipped tickets and reasons in a Guided mode agent's user profile. Looking through skipped tickets can help you identify specific knowledge areas and processes that agents are struggling with. Admins can view skipped tickets for any agent in Guided mode. Guided mode agents can view their own skipped tickets only. Open the agent's profile you want to view. A list of tickets the agent has skipped, along with each reason entered, appears. Click on a ticket to open it and view additional details. Excellent feature - thank you! Finally a tool to effectively prevent "Cherry Picking". Very nice!! What's with the "your assigned tickets" view all "play-only " Agents have? Is there a way for an Admin to change the settings as it can be done with all other views, or can the "your assigned tickets" view be deactivated completely? The other questions I have are about reviewing the skipped tickets. If an agent skips a ticket it will show up in his user profile. The skipped Tickets can be reviewed by the agent himself or an Admin. For how long will the skipped Tickets be present in the user profile? F.ex. The agent skips a ticket, it shows up in his profile, for some reason he figures out how to solve the ticket and reenters the ticket from within his profile. After he has solved the Ticket it still shows up in his user profile. Only makes sense from the Admins point of view, he reviews the skipped tickets to prepare a training or something similar. After reviewing or if the skipping Agent has solved the Tickets I can see no point in keeping them in the skipped tickets list. Additionally after a while the list would be completely overcrowded. The revieving agent should have the option to mark the tickets in the list in some way. Another thing about reviewing the skipped tickets. Right now only Admins can review skipped tickets from another agent. Wouldn't it be possible to optionally grant those rights to other user roles? We want to keep the number of Zendesk Admins as low as possible, reviewing those skipping reasons is something the corresponding team leaders should be able to do without granting Admin rights to all of them. Is there a way to extract an entire list of all the skipped tickets? or create a view for the manager to see them, instead of having to check each and every agent? I would really like a way to report on ticket skipping in Insights. For example if I could have a '% skipped' figure for my team it would be very useful in performance reviews etc. Really great feature! Something what would be even better is if you could choose which views you could have it on, for exempel on views for Good ratings isn't it so necessary. @Thomas - we wanted to make sure that while agents were heavily dissuaded from cherry-picking, we didn't lock down the system to such an extent that agents weren't able to do their jobs. We felt it was important that agents always be able to see and access their assigned tickets, regardless of what else they're pulling from the views. Right now it is not possible to deactivate this "view." The skipped tickets will always remain in their profile... it'll simply paginate once the list gets long. We don't have any plans right now to remove or mark skips from that list. For permissions, I totally get it - managers ideally should have access to these lists, not just admins. We'll definitely be considering this going forward. @Pete - unfortunately we aren't able to add this to Insights right now. I will certainly let you know if that changes! @Philip - We heard that feedback a bit in beta, but ultimately decided to go with the simplest set up as a first version of the feature. Can you tell me a bit more about what other kinds of views you give to agents that wouldn't make "playable" sense? What happens if an agent just clicks 'submit as...' without doing anything to it? Let's say we have a 'new' ticket and an agent just changes the status to open without reassigning or applying any other comments or field changes, that would effectively do nothing to the ticket (for some of our workflows), but would this move them to the next ticket? We also require the ability for other roles other than admin to have access to skipped tickets. But giving the rights to review skipped tickets to other users than Admins would be really awesome! @Erin Boyle - For us this would be great to have in our general email inbox view, just to prevent cherry picking. But for the other views, rating, pending information and social media overview this isn't as good, so the best thing would be to be able to apply it to views - so you can choose were to be most efficient and where it does't matter if the agents cherry picks tickets. Looks good, but really needs the option for reporting and perhaps skip reasons in the ticket on Show all events. The ability to choose which views are Play and which ones aren't would be important. The ability for non-Admin supervisory staff to see skip reasons would be important. The ability to pull out some metrics on people who skip a lot of tickets would be awesome. Will be watching this one closely. Nice to see this feature added in some capacity. Unfortunately, the inability to choose which views are "playable" makes it unusable in our implementation. Seems like this feature would only be useful for Tier I triage. Hoping this gets fleshed out a bit more in future iterations. This feature works wonderfully until it comes to skip reasons. In anything other than a super small organization no one is going to have the time to audit the skip reasons for each agent on the team. This creates a situation where agents are incentivized to avoid entering a skip reason to increase their ticket numbers. Instead, I see tremendous value in skip reasons being added as private comments on tickets by default. If one of my coworkers skipped a ticket, why am I unable to see their reason when viewing the ticket they skipped? Without that information, I have no opportunity to offer a solution I'm aware of to my colleague. Sure I could check their skip reasons if my account has the appropriate permissions, but that is a very click heavy process when viewing a private comment on the ticket that's already open would not be. 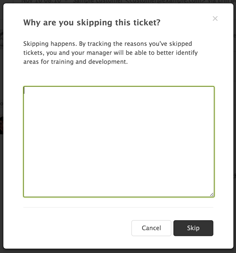 I would really like to see skip reasons work exactly the same as the prompt that appears when merging tickets. The public comment checkbox is ticked by default and I can uncheck the box to make my comment private. However, in the situation of skipped tickets, rather than a public/private option the option would be private/skip comment. Leaving the box checked would add a private comment to the ticket while unchecking the box would add the comment to the skip comments archive on the user's profile. Totally agree with being able to specify which views this applies to. Nice idea but we would absolutely need the ability to specify which views should be play only. anyone able to identify how the Guided mode what ticket to show first? It seems it is the based from creation date or updated date? When I create test tickets (e.g ticket 1, ticket 2, ticket 3) and test the Guided mode, the first ticket that will show up is ticket 3. Assuming Agent took ticket 2 and tried using again the Guided mode, the first ticket will show up is still ticket 3 that makes me think its based from latest created date? I also tried updating ticket 1 as Admin and when I switch back as Agent to test Guided mode, ticket that will first show up is still ticket 3. We'll try to serve the first ticket in the order that the view is sorted that the agent hasn't already skipped and that no other agent is already viewing. Basically Guided Mode is hooking into our Play button functionality. Hi Erin, are there there any upcoming/planned enhancements for this feature? I'm specifically interested in allowing roles other than Admin access to view the Skipped tickets. We don't have any other planned enhancements at this time. That could, of course change, but our priorities are elsewhere at the moment. Can you tell me a bit more about who you'd like to have access Skipped tickets? We really like the idea of Guided Mode but unfortunately, we can't use it. We have a view just for problem tickets so that our agents can easily see what the current issues are and we want that view to be readily available to everyone. Viewing the tickets through play mode and them write a reason as to why they're skipping the ticket would seem pointless in this situation. Therefore it would be helpful if we could apply the play view option based on role and view. 1. Modify the 'My Assigned Tickets' view to only show open tickets rather than anything less than solved? 2. Have guided mode automatically skip over tickets already assigned to another agent? Thank you for your help and suggestions in advance. Agree on #1 this is something we need as well. Regarding #2, we have solved this by settings up the views to not include tickets that are already assigned. Also if im not mistaken, the dashboard/home shows 0 tickets when in guided mode, just for your information. Thank you for the suggestion and the info. Another option for #1 which I think would help is the ability to group by status. This is already how it is displayed on the agent profile and would definitely help to organise the 'My assigned tickets' view with open tickets grouped at the top. We recently began using the Guided Mode and so far so good....but, we have noticed some agents skipping tickets and not entering reasons. That makes monitoring skipped ticket difficult since it is not recorded as a skip on the agent profile if no reason is given. Is there any way to require a reason is given when a ticket is skipped? At a bare minimum allowing admins to edit ordering of "My Assigned Tickets" view that is automatically created. +1 on selecting the views this applies to - this will make it more user-friendly for managers. PS. Anti cherry-picking should have been @Zendesk ages ago. I really can't understand why Enterprise plan is required to use the guided mode. I think cherry picking affects every Zendesk accounts with multiple agents, does not matter if on Essential, Team, Professional or Enterprise. It seems that this feature is still not available for multiple views, is that correct? What I mean by that is we have agents in completely different functions and so they have different views entirely. Will this work for an agent that we only want pulling from one view?